T.O. * is a newly married young Christian woman, from a local tribe, who was brought up in a traditional family. We met her for the first time in 2014, when she was only nineteen years old. Her strong character and commitment, as well as her love for the Lord and her desire to follow Him, has been evident ever since the first time we met her. 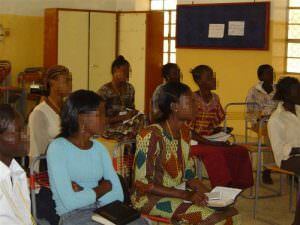 Later, she had the desire to form a discipleship group for women in her church. At first the church leaders didn’t accept her idea, but they later agreed. Now, she is the young leader of a women’s discipleship group in her church. T.O. * got to know about our ministry through a friend, who invited her to come to one of AWEMA’s seminars for women. At the seminar, she encountered the Lord and started to know him on a deeper, personal level. “I learned many things at the seminar that were useful to me,” she shared. She was deeply encouraged by the sessions and women leaders of the ministry. She passed her encouragement and passion on to her family, and led them in following the Lord. “I have always been sharing in the seminars about how God is transforming my life and how He has helped me and my family through the many difficulties we have faced,” she said. She has always been praying for a transformation in the lives of her family members. “They were nominal Christians, but I thank God they are changing and following him.” One of the major changes she shared with us was when she decided to get married. T.O. was married last July to a Christian man, who loves the Lord. We are so happy with the new Christian family that was formed. They will be moving to the United States to live there. She decided that she will form a discipleship group when she lives there. We are praying that God will bless her new family and give her the strength to keep on with her ministry when she moves to the United States.